I work in clay because I love the search for a beautiful shape – just the right curve, the over-all balance and how the finished piece sits with the hint of a shadow line. Smoke-firing refers to a firing technique where works in clay are fired in a primitive outdoor kiln to encourage marks and blushes of colour on the canvas of the vessel. Come see for yourself the magic of painting with fire! 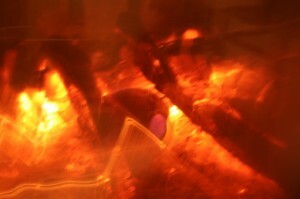 Looking inside a kiln at a small vessel amongst the hot coals.